Powered by a brawny Nvidia Tegra X1 processor, the Pixel C is the first Android tablet that Google has built on its own. It’s also a very compelling option, thanks to its beautiful display, long-lasting battery and detachable design. The Android platform needs to evolve to enable greater productivity, but this might be a perfect device for Google service users. With its sleek, anodized aluminum shell and thin indicator lights, the Pixel C is a beautifully minimalist take on tablet design. The tablet’s stereo speakers sit on its sides, and its headphone jack is at the top of its right side. The Pixel C’s volume controls and USB Type-C port are at the top and bottom of its left side, respectively, and the power button sits on the top edge. The tablet’s 2-megapixel front camera is in the middle of the bezel above its display, and its 5-MP rear shooter sits on the upper-right corner of its back. Google placed the Pixel C’s status lights at the top of the shell. If the tablet is off, you can tap twice on the shell to see the tablet’s battery status with the blue, red, yellow and green lights. Weighing 1.1 pounds and measuring 0.3 inches thick, the Pixel C is lighter but thicker than the Lenovo Yoga Tab 3 (1.5 pounds, 0.18 inches) and the iPad Pro (1.57 pounds, 0.27 inches). The Microsoft Surface 3 (1.37 pounds, 0.34 inches) is heavier and thicker. As I watched the trailer for X-Men: Apocalypse on the Pixel C’s brilliant 2560 x 1800-pixel display, the tablet impressed me with rich colors and sharp details. The saturated black shadows that followed Apocalypse were inky and deep, and Nightcrawler’s blue skin and Cyclops’ bright red retina blasts were rendered vividly and accurately. Intricate details, such as the patterns of Apocalypse’s armor and the jagged metal debris floating around Magneto, looked sharp and crisp. As I drew on the Pixel C’s screen in Autodesk SketchBook, the tablet’s display followed my finger accurately. Unfortunately, as I sped up, tracing spirals with my index finger, I noticed latency in the display’s ability to react. When measuring the Pixel C’s display, we found it has 509 nits of brightness. That means it’s brighter and easier to read in direct sunlight than the iPad Pro (374 nits), the Yoga Tab 3 (439 nits) and the Surface 3 (407 nits). According to measurements we recorded with our colorimeter, the Pixel C can display 110 percent of the sRGB color spectrum. That is near the score for the iPad Pro (111 percent) and more than those for the Yoga Tab 3 Pro (99.4 percent), the Surface 3 (99.3 percent) and the average tablet (93.8 percent). The Pixel C scored 1.9 on the Delta-E color accuracy test (0 is perfect), which beats the tablet average (3.5) but not the Yoga Tab 3 (1.4) or the iPad Pro (0.2). You have to buy Google’s optional Pixel C Keyboard ($149) separately, but it’s well worth your consideration. A deep keyboard, full size and well-balanced weight mean you can comfortably use the docked Pixel C without a hard, flat surface. That is more than its competitors can say. When I typed parts of this review on the Pixel C in my lap, the display and keyboard, helpfully, did not move. That’s much better than the Surface 3 and the iPad Pro, both of which we found to be awkward to type on in our laps. Taking the 10FastFingers.com typing test on the Pixel C, I clacked my way to 69 words per minute with 95 percent accuracy, which is just a little less than my average of 69 wpm with 99 percent accuracy. While we love that the Pixel C’s keys offer a deep 1.64 millimeters of travel and require 58 grams of force to actuate, we wish its keys weren’t so close together. To make its keys as large as possible, Google swapped out the typically wide Caps Lock button for a smaller Search key, removed the bracket and backslash keys, and shrunk the right Shift, Tab and Enter keys. Still, the 10.2-inch tablet’s keyboard feels more cramped than those of the 10.8-inch Surface 3 and the 12.9-inch iPad Pro. The Pixel C Keyboard connects over Bluetooth, but it doesn’t require any work to pair it, letting you type the moment the display docks with the keyboard. Unlike other Bluetooth devices, this keyboard doesn’t need any batteries because the Pixel C recharges it via inductive charging when the two sit in the closed position. Weighing 0.88 pounds, the Pixel C Keyboard is heavier than the Surface 3’s 0.6-pound Type Cover and the iPad Pro’s 0.6-pound Smart keyboard. Thanks to powerful magnets, the Pixel C can sit flush with its keyboard in the closed position and attach to the keyboard’s hinged flap for laptop mode. The magnets are so strong that the tablet will pull up the keyboard from about an inch away, and when I tried to pick up the docked Pixel C after placing it on a tin filled with holiday sweets, the entire tin came up with the tablet. Once the Pixel C is in laptop mode, its display can be adjusted between a flat 180-degree position and a nearly 90-degree angle. The Pixel C will stay upright no matter how far back you place the screen, unlike some other 2-in-1s we’ve reviewed, whose tablet displays were so top-heavy that they toppled over at oblong angles. Detaching the Pixel C from either position seemed awkward the first time, but I got used to its powerful magnets quickly. The screen only moves when you push or pull it, and while the Pixel C can only move within a 90-degree range, that movement is more natural than how the Surface adjusts. With an Nvidia Tegra X1 processor, 3GB of RAM and a Maxwell GPU, the Pixel C has plenty of power under the hood. I streamed music in the background from Google Play while I navigated between a dozen open tabs in Chrome, a Google Doc, Autodesk SketchBook and Asphalt 8, which caused little lag. However, when I played the processor-intensive racing game Asphalt 8 on its own, the game ran smoothly. As the game filled the display with a plethora of flying car parts, smashed lane dividers and shattered glass — without any stuttering or lag — I realized this was one impressive tablet. When we ran the Geekbench 3 overall performance test on the Pixel C, the tablet notched an impressive score of 4,444. That’s better than the Surface 3 (3,531), the Yoga Tab 3 Pro and the average tablet (2,725). The iPad Pro (5,416) earned a higher score. The Pixel C scored 40,739 in the 3DMark Ice Storm Unlimited synthetic gaming benchmark test, beating the average tablet (16,657), the Yoga Tab 3 Pro (26,011) the Surface 3 (24,840) and the iPad Pro (32,920). Our PDF Open Test, which measures how long it takes to open a high-res 5.8MB PDF, completed in 5.96 seconds on the Pixel C. That’s faster than the Yoga Tab 3 (12.54 seconds) but just shy of the iPad Pro (4 seconds). The Pixel C took 2 minutes and 47 seconds to convert a 203MB video file from 1080p to 480p in the Vidtrim app. That’s much shorter than the time the Yoga Tab 3 (4:50) needed to complete the same task. As I listened to a Frank Ocean playlist on the Pixel C, its stereo speakers did a great job with high notes of the chorus of “Thinkin Bout You,” which came out strong and accurate. The tablet pumped full, sturdy bass for “No Church in The Wild,” and the mix of midrange percussion instruments in “Swim Good” came out well, with each cymbal hitting crisply. The Pixel C comes with a clean installation of the latest version of Android, version 6.0 Marshmallow. Unfortunately, stock Android hasn’t made the leap to being a productivity-ready operating system. The most glaring oversight here is the lack of a multitasking split-screen mode. Apple, Microsoft, Samsung and even Acer have enabled this feature in tablets. On Tap, a new feature introduced in Android 6.0 that will suggest links based on what you’re reading, worked well, but a couple of questionable choices showed that it’s far from perfect. To bring up On Tap, I held down the home button to get a recap of a Knicks/Bulls basketball game. That brought up Google Now cards for Knicks players Arron Afflalo and Kristaps Porzingis, but it also included links to Dell and Alienware, because those companies’ names appeared in ads on the page. Primarily using the Pixel C in laptop mode, I found that not all popular apps are ready for use with a keyboard. The Android versions of Microsoft Word, Excel and PowerPoint use many of the same keyboard shortcuts that desktop users may be familiar with, but the Enter key doesn’t send messages in Facebook Messenger, so I had to reach up and touch the screen. Google’s own apps, like Hangouts and Docs, don’t have such problems. However, those apps do a poor job of filling up the Pixel C’s 10.2-inch screen in landscape mode. Hangouts fills the entire width of the display with a single conversation, leaving a lot of empty space in the middle, and Docs’ Research Mode splits the screen horizontally, wasting space on the left and right. Other well-known third-party apps, such as Slack and 1Password, will kick the display into portrait orientation during setup, and Instagram continues to provide zero support for landscape orientation. Not only does the Pixel C charge its optional keyboard so you don’t have to, but the tablet itself has enough battery life to last an entire workday. The Laptop Mag Battery Test (Web surfing over Wi-Fi at 150 nits) took 11 hours and 8 minutes to drain the tablet, which is longer than the average tablet (9:02), the Surface 3 (8:01), the Yoga Tab 3 Pro (10:35) and the iPad Pro (10:04). The 2-MP front camera on the Pixel C did a good job of reproducing the reds of the Purch wall at our well-lit office, as well as the dark gray of my shirt, but there was a lot of noise in the selfie. In photos taken with the tablet’s 5-MP rear shooter during daytime and nighttime, the photos shot at night were much noisier. The 32GB version of the Pixel C costs $499; the 64GB version we reviewed costs $599. 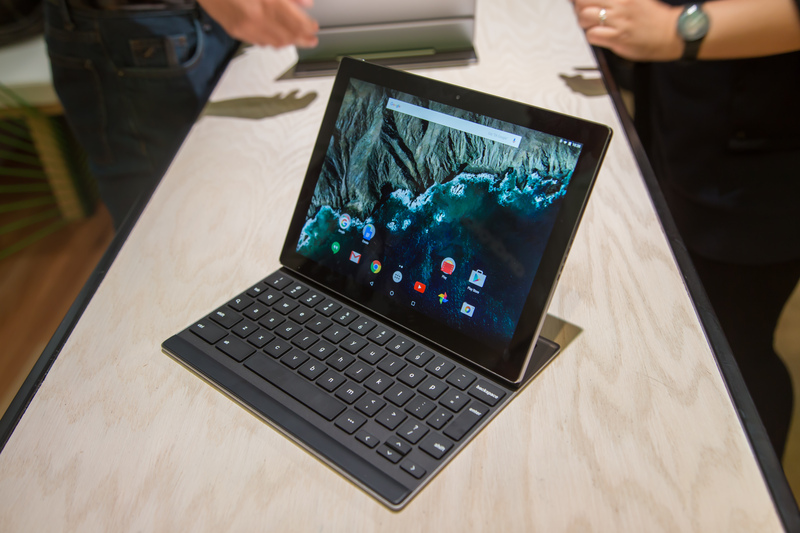 Google sells the metallic and leather folio case versions of the Pixel C Keyboard for the same price, $149. With its fantastic processor power; rich, beautiful display; lengthy battery life; and excellent design, the Pixel C (starting at $500 and $649 with keyboard) is a great way for Android users to get a tablet-with-keyboard experience similar to what Microsoft’s and Apple’s latest tablets offer. We only wish that Android and its apps did a better job of supporting keyboards and filling larger displays, and that the Pixel C Keyboard gave its keys more breathing room. The Surface 3 (starting at $530 with Type Cover) and the iPad Pro (starting at $969 with Apple Smart Keyboard) have better keyboards and shorter battery life, and don’t sit as nicely in your lap, but each of those tablets offers better multitasking than the Pixel C. Users who want a powerful Android tablet but don’t need a keyboard can get the Lenovo Yoga Tab 3 Pro ($450), which has slightly less battery life and comes with a secondary projector display. The Pixel C is great for Android users who excel on smaller keyboards, live in Google apps and want a powerful tablet that’s great for gaming.